To structure object data layout-wise, there are 3 panel types and 4 other layout elements available. 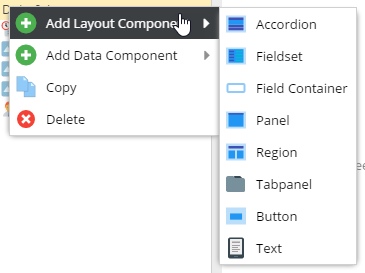 Data fields are always contained in a panel. Panels can be nested and thereby a data input interface tailored to the users's needs can be designed. Button - with a custom handler. Context of the handler js is the edit tab of the object. Text - to add minimally formatted text to an object layout. This can hold descriptions and hints which don't fit into a field's tooltip. Please note that since release 4.4.2 it is possible to generate this text dynamically. Please read this page for further details. IFrame - provide a URL and make use of the context paramater to render the response of your choice. Please read this page for further details. Pimcore uses Ext JS layout components for all object layout elements. For a deeper understanding of the layout elements, please have a look at the Ext JS documentation pages and examples.